Botanical Name of Ardraka (ginger) is Zingiber officinale. The family name of Ardraka is Zingiberaceae. Ardraka zingiber officinale (ginger) is one of the reputed drugs of Ayurveda, also termed as shonth, shunthi, adrak etc and is employed in indigenous systems of medicine for a very long period. The trade scholars of Ayurveda viz Charaka, Sushruta and Vagbhatta mentioned its use in udara roga (diseases of the digestive system), shotha (inflammations), karna shoola (an earache), in kapha and vata roga. Ardraka has been described by Sanskrit writers as Acrid, healing, carminative, rubefacient, useful in infections of the throat, head, chest, haemorrhoids, rheumatism, dropsy and many other diseases. Trikatu, a favourite carminative remedy which has shonth (shunthi or ginger) is often prescribed. Ginger with salt taken before meals are considered to be a highly reputed carminative. It is taken to clean the tongue and throat and increase the appetite. Fresh Ardraka is much employed as a domestic medicine, the juice with sugar or honey is prescribed for colds and coughs. In European medicine, Ginger is one of the most highly valued carminatives and enters into many official preparations. The drug ‘Shunti’ has been described in various Ayurvedic classics as well as modern textbooks for its different uses. In Vedas, the description about shunti is not available. But after the period of Vedas, the use of shunti is seen in almost all books of Ayurveda and also in modern texts. In Sushruta samhita sutrasthana, 46th chapter, it is mentioned that it is having katu rasa, ushna veerya and having laghu, hridya and deepana properties. It is also mentioned that it is sasneha and rochana. In Sushruta Samhita kalpasthana, it is mentioned as it cures visha (poison) with the help of other drugs such as Chavya, Haritaki, Vidanga, Pippali, Madhu and Shrankota beeja for drinking purpose. In Sushruta Samhita, shaarirasthana, it is mentioned as it cures Ruk (pain). In Charaka Samhita, Suthrasthana, 27th chapter it is mentioned that qwatha of shunti and pippali with laja and dadima cures kshutha (skin diseases), pipasa (thirst) and malapaha and it is pathya. In Charaka chikitsa, 21st chapter it is mentioned that draksha, parapataka, shunti, guduchi, dhanvayasaka at night cures trishna (thirst) and visarpa (erysipelas). In Ashtanga hridayam, chikitsa sthana, 1st chapter it is mentioned that hima of chandana, shunti ambu, parpataka and ushira cures jwara (fever) and it is having pachana (digestive) action. In Kaideva nighantu, it is mentioned that it is having katu rasa and ushnaveerya. It is deepana and cures shwasa (asthma), kasa (cough), vami (nausea and vomiting), hikka (hiccups), vibanda (constipation), vaha and pitta dominating diseases. In Rajanighantu, it is mentioned that it is having katu rasa and ushna veerya. It is deepana and hridya and it cures shopha (oedema) and diseases of throat. In Bhava prakasha nighantu, it is mentioned that, before the meals it is always pathya with the help of lavana for bhakshanartha (loss of appetite). It cause agnisandeepana (appetizer), ruchya and vishodhana of kantha and jihva (purification of throat and tongue). It cures kushtha (skin diseases), pandu (anemia), rakta pitta (bleeding disorders), vrana (wounds) and jwara (fever). It is contraindicated in daha (burning) condition and sharada ritu. In Madanapala nighantu, it is mentioned that, Shunthi is having the actions like ruchya, amavatagni, pachani and laghu. It is having snigdha and ushna guna, katu vipaka and cause vibandha of vata and kapha. But Ardraka is having guru guna and deepana and bhedana actions. In sharangadhara Samhita, it is mentioned that shunti made in to kalk (paste) along with guda and tila, and taken with anupana i.e. dugdha (milk) cures parinama shoola and amavata. In Dhanwantari nighantu, it is mentioned that shunti is having snigdha and ushna guna and vrishya property. It cures shopha, aruchi, vathodara, shvasa, pandu, shlipada etc. In Ayurveda, Shunthi and Ardraka are mentioned as varieties of ginger. Moisture – 8.5 – 16.5% dry cut, crude protein 10.3 – 15.0%, crude fibre 4.8 – 9.8 %, starch 40.4 – 25.8%, cold alcohol extr. 3.6 – 9.3 % , and volatile oil 1.0 – 2.7 %. Analyses of a bazaar sample of green ginger gave the following values – moisture 80.9%, protein 2.3%, fat 0.9%, fibre 2.4%, carbohydrates 12.3%, and minerals – 1.2%, calcium 20%, protein 60%, and fibre 2.6 mg/100 g. Ginger contains traces of iodine and fluorine. The vitamin present in green ginger are -Thiamine 0.06, roboflavin 0.03, niacin 0.60 and utc 6.0 mg / 100 g. the value reported for carotene in the fresh rhizome is 40 mg /100 g.
Ginger contains small quantities of glucose, fructose and sucrose. The principal carbohydrate of the rhizome is starch. Ginger contains 1.60 – 2.44% nitrogen on dry basin, of which non-protein nitrogen accounts for roughly on third. The free amino acids present in ginger includeglutamic acid arpartic, r-aminobutylic acid, valine, phenylalanine, arparagine, lysine, cystine, listridine, uciner, praline and pipecolic acid. Non volatile pungent principle – oleoresin contains gingerol, paradol. Non pungent substance in alcoresin include plmitic and other fatty acids. Water soluble extracts – not less than 15% (90%) Alcohol-soluble extractive- not less than 4.5%. Total ash – not more than 6% water soluble and – not less than 1.7%. Ginger is aromatic and beneficial in dropsy and dyspepsia, anti-emitic, anti-rheumatic, anti-spasmodic, carminative, digestive, diuretic, stimulant and stomachic, used in infections of the chest, colic pain, cold and cough, haemorrhoids, sore throat and hoarseness of voice and urticaria. To improve appetite and digestion, mix trikatu in some ginger juice and gargle few times to acquire a strong appetite and power of digestion. In indigestion, the decoction of dry ginger and rock salt is very helpful in tackling undigested material. In Jaundice, take a teaspoon of powder of dry ginger with some jaggery twice a day for free passage of stool and as a liver tonic. In Ascitis, take equal quantities of ginger juice and milk every day after meals. In Diarrhoea, boil dry ginger and khas-khas roots in a glass of water and take thrice a day to arrest loose motions. In Cholera, add some dry ginger powder to a decoction of the flesh of Ball fruits (Bilva or bel) and take this twice a day to arrest vomiting and diarrhoea. In Piles, make small balls of dry ginger and jaggary of peanut size, eat one twice a day to reduce the pile mass size and allow free passage of stool. In Colic pain, equal parts of shunthi, til (sesame) seeds and jaggery should be pasted and drunk with milk twice a day. In Cold or Asthmatic attacks, ginger tea – crushed ginger is added to boiling water and tea is prepared with this water. Take this tea to decrease inflammation and relieve congestion and body ache. In Asthma à A few garlic cloves may be added to the above tea. Ginger may be mixed with mustard oil and applied externally on the chest to relieve congestion. In Earaches, warm a little Ginger juice and instil a few drops in the ear to relieve pain and clear ear wax (cerumen). In Arthritic joints, decoction of dry ginger and caster roots should be taken every morning for lubrication of joints and relief from pain. Blood in Urine- Boil 1 teaspoon of dry ginger in a glass of milk and drink twice a day to arrest the bleeding. In allergic rashes, crush some old jaggery in ginger juice and take twice a day. In hiccups, mix jaggery and ginger juice and instil a few drops in the nostrils to stop hiccups. In heart disease, take a hot decoction of dry ginger often in the morning meal daily. A toothache- Apply a paste of dry ginger on the outside of the cheek at the point of pain. On Insect bites or stings, a dry ginger paste mixed in yoghurt is an effective topical application to reduce the swelling. In scrotal swelling- apply a mixture of dry ginger and salt solution in testicles to reduce pain and swelling. Also, Ardraka swarasa (juice) is taken orally with honey. In Parinama shoola, kalka of shunthi, guda and tila with milk is advised. In Deepanartha à Shunti choorna with Yavakshara and ghee is used. In Grahani, Shunti along with bala and bilva choorna is advised. In Vishamajwara, kwatha of shunti and maha bala moola choorna is advised. Following Ayurvedic medicines are available in the market in which Ardrak is used as an ingredient. Swarasa – 1/2 – 2 tsp or 5-10 ml. Churna – 3 – 7 or 1-2 gms. Ginger is adulterated with exhausted ginger, but it can be detected by determination of water-soluble ash, volatile oil content and alcohol and water-soluble extractions. Wall’s (1967) mentioned that Japanese ginger which usually occurs in small flattened unscraped pieces is used as the adulterant. It can be differentiated from Z. officinale having the presence of compound starch grains. 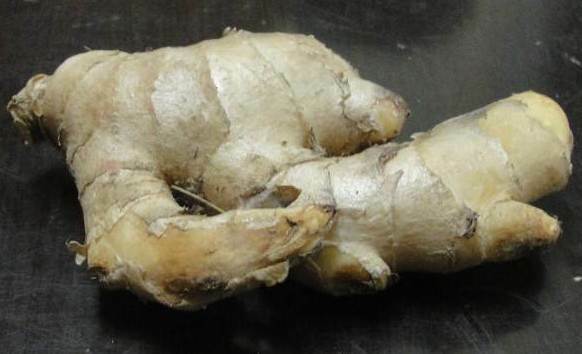 Besides this exhausted ginger, which is found generally in the form of powder, is also used as an adulterant. It is impossible to detect this adulterant by the use of the structural characters of the powder.